When it comes to goal setting most of us are familiar with the acronym SMART. But what are POWER Goals? And how are they different? In this blog post, we’ll explain this wildly successful goal setting system (and why you need it in your life). The POWER Goal System, designed by The Power to Reinvent, is based on NLP (Neuro-Linguistic Programming). They are completed in five steps and are specifically designed to fully utilise the power of goal setting. How are POWER Goals different to SMART Goals? Great question. Like SMART Goals, the POWER Goal System is a guide to help you set and achieve goals. Both goal setting systems emphasise the importance of clarity, achievability and measurability. However, Power Goals go much deeper than SMART Goals. Let’s explore the three main differences. In our frantic, social media-fuelled world many of us are influenced by the noise of other people’s opinions. We unwittingly fall into the trap of setting goals because we feel we ‘should’. The POWER Goal System enables us to check that a goal is the goal is right for us and that it will have a positive impact on our lives. It uses our intuition and inner voice to go after what we really want, not what we feel obligated to. Unlike our conscious mind, the subconscious never sleeps and never rests. In fact, our subconscious mind is 30,000 times more powerful than our conscious mind. Once we communicate what we want to the subconscious, it works 24/7 in the background to achieve it. The POWER Goal system uses this force to help us achieve more in less time. And let’s be honest, in our busy world, hands up who doesn’t want that. Unlike SMART Goals, POWER Goals integrate the process of visualisation to manifest success. In fact, visualising what we want is a technique praised by many successful people. Oprah Winfrey uses vision boards to realise her dreams. Will Smith said that visualising success helped him become a Hollywood superstar. Finally, Richard Branson admitted visualising his future is one of his greatest strengths. How does the POWER Goal system activate The Law of Attraction? POWER Goals activate The Law of Attraction in two ways. Firstly, POWER Goals are stated in the positive, directing our energy towards what we want (not what we don’t). Secondly, POWER Goals use all our senses to get us to see hear and feel what it’s like to achieve our goal. Working together both elements of the POWER Goal system harness The Law of Attraction. Ultimately, bringing us closer to reaching our goals, faster than we could have ever imagined. If you are ready to set and achieve the goals that really matter to you. You need The Power Goal System in your life. 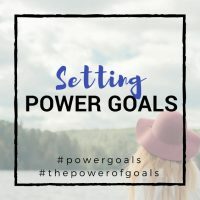 To learn more about this powerful approach to goal setting check out our free (and comprehensive) ultimate onsite goal setting guide here.